Ross’s or Lady Ross as it sometime called is a medium-sized bird, with a long tail and broad, round wings. They have three toes on each foot that point forward, while the fourth toe can be rotated forward or backwards. Males and females differ in that females may have a greenish beak. 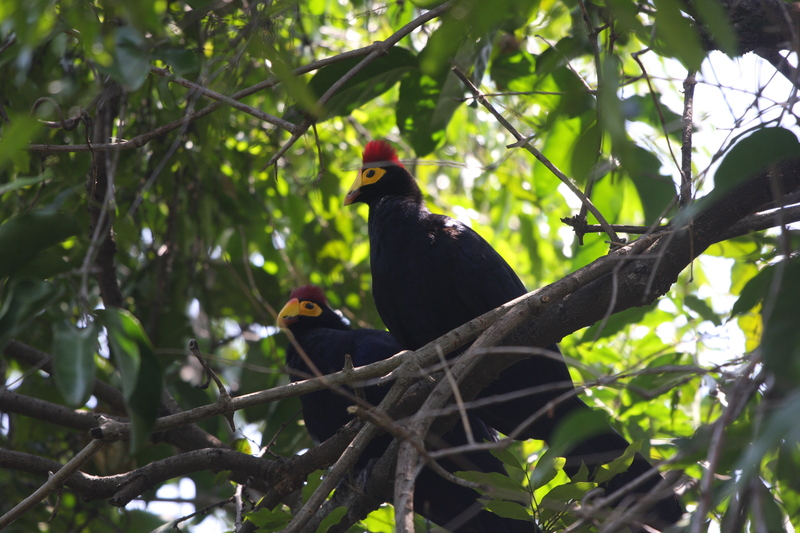 This Beautiful Turaco is seen in mostly on the western side of Kenya Great Rift Valley mostly in areas around Tugen Hills and El geyo escarpment. Ross’s Turaco is a very social bird, seen mostly moving is a small noisy flock of 2 to 7 birds. They spent most of their time among trees in search for fruits until evening when they nest solitary on a plat form of twigs.It is an easy bird to Identify because nothing else in our region is like it. Although it has a relatively dull appearance for most of the year, the Greater Sand Plover’s plumage changes during the breeding season. At this time, the crown changes from greyish-brown to a dull brick red, as does the white breast, and the small feathers that cover the ear region change colour from a dusky grey to black. The chin and throat remain white throughout the year, while the nape and forehead are a greyish-brown colour all year round. The greater sand plover is a carnivorous species that varies its diet seasonally; during the breeding season it feeds mainly on terrestrial insects and their larvae, especially preying on midges, ants, beetles and termites, but also occasionally hunting larger animals such as lizards. During the non-breeding season, the greater sand plover mainly eats marine invertebrates, such as snails, worms, crabs and shrimp. Usually feeding at low tide on wet ground, just away from the water’s edge, the greater sand plover detects and catches prey with the help of good eyesight and the ability to sprint over short distances. A sociable species, the greater sand plover often feeds and roosts in flocks. It typically feeds in flocks of between two and fifty individuals but sometimes congregates in groups as large as one thousand whilst roosting, which is mainly done on sand bars at high tide. The bird above was photographed at Mida-Creek, when the tide was low and the bird was in mixture of species like Crab Plover, Lesser Sand Plover, Eurasian Curlew, Whimbrel and White-fronted Plover. All my records on this species were in Mida-creek, Watamu. African Pygmy Kingfisher is a small insectivorous kingfisher found mostly in woodland habitats and not necessarily restricted to wetland.In Kenya, its range widespread in bushland of Lake Baringo, Kerio Vallye,Samburu,Meru and Nakuru National and southern parks of Amboseli, Tsavo East and West. Its habitat range from woodland habitats, savannas and riverine forests, but also scrublands, grasslands, open rivers and streams, coastal bushes, plantations and gardens.The dark blue crown of the adult separates it from the African Dwarf Kingfisher. The smaller size and violet wash on the ear coverts distinguish it from the similar Malachite Kingfisher. Blue-cheeked Bee-eater is a long tailed, bright green bee-eater with black mask, mostly white forehead,green crown and pale blue or whitish superciliary and cheek stripes conspicuously brighter than surrounding green plumage; yellow chin merges with russet throat. Underside of the wings coppery rufous. First winter birds are duller, more olive than adult, and sometimes retaining pale-edged juvenile feathers ;forehead green, narrowly yellowish bill; chin pale yellowish buff grading into rufous-buff throat patch. Vitelline Masked Weaver is a common wevar that is at home in and around habitat in the dry acacia belt. It is a species that is similar to large Black-headed Weaver, but can be easily separated given a good view. Although both species have red-eyes and warm-chestnut border to their black faced-mask, the black on the male Vitelline’s head does not extend onto the crown or down onto the breast, and it’s back does not have strong black “tramline” as in Black-headed Weaver. The female Vitalline shows a pale narrow bill compared to the dark, heavy bill of the female Black-headed weaver, and the breast and flanks are generally a warm buff contrasting with a white belly. In Kenya huge concentration of this species can be recorded in dry areas a round Lake Bogoria and Baringo, Kerio Valley, Samburu National reserve, Meru National Park and Tsavo West and East Parks. This is an adult male fan-tailed widowbird, Euplectes axillaris, a member of the avian family Ploceidae, the weaver birds. One of its cousins is the red-billed quelea, Quelea quelea, the most abundant bird in the world.This species has an extremely large range, so incidence of you spotting it while birding in Kenya is very high. They exhibit sexual dimorphism and female appears brown, with the distinctive red-shoulders which clear when the bird air-bone. In Kenya this species is mostly seen in Masai Mara, mostly a long the northern part of the reserve around the Musiara Swamp. Yellow-throated Longclaw is a stocky grassland bird, that has a tendency of up and down when flushed out, exposing the conspicuous white edged tail.When perched the bird has a V-shaped black band white a bright yellow throat.The head and the upper part of the bird is all brown with little white on the upper neck.Young birds appear more buff yellow with band of indistict short streak on the breast.In Kenya it is widely distributed in areas like Aberdare park, Solio Ranch, Nairobi National park and Masai Mara national reserve.